Cre recombinase is a topoisomerase isolated from bacteriophage P1. It has found widespread application in the genetic engineering of cells and multicellular model organisms, in particular mice. Cre recombinase recognizes so called loxP sites, partially palindromic sequences of 34 base pairs, in double-stranded DNA. Based on the directionality of the loxP sites, Cre excises or inverts the DNA between them. This Cre/lox system has been cleverly engineered to allow for activation and deactivation of gene expression in a wide range of biological systems. 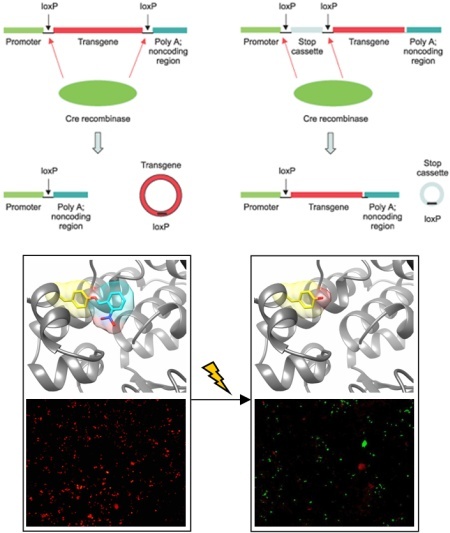 We developed optochemical control of Cre-mediated DNA recombination by placing a light-removable caging group onto an active site tyrosine residue. With the caging group in place, the tyrosine cannot undergo a nucleophilic attack onto the DNA phosphodiester backbone, thus rendering the enzyme completely inactive. Exposure to UV light removes the caging group and activates the Cre recombinase. This enabled us to optochemically control both gene activation and gene deactivation in mammalian cells.